If 'What More Do You Want From Me' from Al Green's 2010 release was recorded in 1973, it may have sounded like this. A simple, but groove heavy pattern that has two subtle sections, which are interlinked using tasteful fills. Taken from the forthcoming Royal Drops album due out in December. 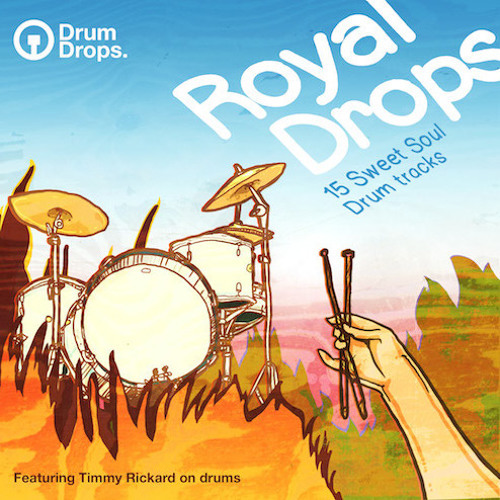 Royal Drops is an album of 15 sweet soul drum tracks, engineered and performed by Timmy Rickard. Royal Drops takes its reference from the music produced at Royal studio in Memphis during the 1970’s. Home to legendary producer and founder of Hi Records, Willie Mitchell. The tracks are based upon recordings of Hi Record artists Al Green and Anne Peebles, with drummers Al Jackson JR and Howard Grimes providing their unmistakable grooves. This release incorporates key components found in the classic Hi Records drum sound, including swung bass drum patterns, 8th note emphasis on the hi hats, classically simple drum fills and a few 6/8 drum grooves. A big reason why this drum style is so revered is because of the thoughtful simplicity in which Al Jackson JR and Howard Grimes composed their drum parts. Using that same ethos, Royal Drops will be perfect for a wide range of producers and composers who are looking for timeless grooves to get creative with. Unlike the one microphone, large open room drum sounds coming out of Motown and Stax in the 60’s/early 70’s, Willie Mitchell preferred a small dry room, often using three or four microphones on the drum kit. The concept behind the mic positioning is unique to this release. We used four mic’s, each placed in carefully selected positions around the kit, so each mic captures the drum kit as a whole, meaning you can use any one mic as your drum sound, or you can blend some/all of the mic’s to create your ideal sound. We used one Coles 4038 positioned between the hi hat and the rack tom, which gives a snare heavy drum sound. The second Coles 4038 was positioned under the ride cymbal between the rack tom and the floor tom, which produces a bass drum heavy sound. The third Coles 4038 was positioned about 4ft behind and to the right of Timmy, on the floor tom side, capturing all the lovely attack sound from the vintage Gretsch kit. The Fourth and final mic used was either a Beyer M160, or an STC 4021 (aka - Ball & Biscuit mic). This was placed in a more conventional overhead position, directly over the snare drum, capturing that classic lofi drum sound. The mic’s went through a Neve 1066 mic pre, two Telefunken V76s and a Calrec PQ1061. Of course like all other Drumdrops drum tracks we recorded on to 2” 16 track tape running at 15 ips to give extra bottom end. The sound though would not be complete without the right kit. We used Timmy Rickard’s vintage 1960’s Gretsch with a 20” x 14” Kick drum, 13” x 9” Rack Tom and a 16” x 16” Floor Tom. The snares used were a combination of two Gretsch Renown Maple Snares (14” x 6” and 14” x 5”), a Ludwig Acrolite 14” x 5” and a Ludwig 400” 14” x 5”. Cymbals were wonderful dark sounding Bosphorous New Orleans Hi Hats (2 x 16” Crashes), a 20” Ride and an 18” Crash. On a number of tracks we have added shakers, tambourines or congas. This tribute to the Royal Studio drum sound would not be complete without the signature low pitched snare, muted by Timmy’s wallet. The classic tea towel trick on the toms was occasionally used, as was a chain on the ride cymbal giving certain tracks that jazz flavour. However all these touches would remain obsolete if it weren’t for the fact that Timmy has educated himself to play with a really light touch, mimicking the way these classic drummers played. Timmy was also instrumental in the production and mixing of the tracks which he recorded with the Drumdrops in-house engineer Ben Thackeray. In case you were wondering, here’s a little bit more about the man behind this release. Timmy Rickard is a South London based drummer, composer, engineer and producer, and the founder of Monosole Music. Timmy has toured all over the world as a live drummer, but his heart is in the recording studio. He is often found working on various projects with different producers in studios across the UK and Europe, and also at his own studio in South London. This is where Timmy spends his time producing and mixing tracks for various artists, but mainly recording drum tracks, championing his less is more approach to engineering. All fifteen tracks can be purchased as individual tracks as multi-tracks (unmixed), stems and mixes (mixed) or drum loops (available as apple loops, rex2, WAVs).